The center of your Samsung world? Look, it's Samsung's Galaxy Note Ultra Pro 24 – psych! It might look like a gigantic Galaxy Tab Pro 12.2 on a stand, but this is the update to the Korean vendor's flagship all-in-one PC, the 24-inch ATIV One 7 2014. At first glance here at CES 2014, it's clear that Samsung looks to adopt a single design aesthetic across as many devices as possible. Lucky for Samsung that it's an attractive one. Running Windows 8.1, the ATIV One 7 looks like something out of a sci-fi flick, with its all-white glossy shell with chrome edges and few hard edges. Honestly, it looks like the iMac of Windows PCs, only with slick glowing LEDs on its bezel for Bluetooth, volume and video input source control. Inside, Samsung packed this version with a dual-core, 1.6GHz Intel Core i5 4200U CPU running Intel HD Graphics 4400 coupled with 8GB of RAM. To stow away your files, a 1TB hard drive is on offer behind that 24-inch, 1920 x 1080 LCD with 10 point multi-touch control. Folks might scoff at all-in-one PCs, including me at times. 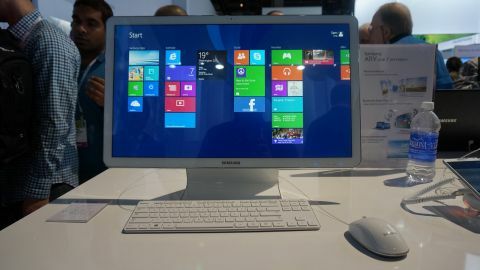 But Samsung makes an interesting case for the ATIV One 7 with its focus on networking and software that tethers your Samsung devices together. For instance, Samsung has brought its SideSync software to the One 7, allowing you to respond to texts, view photos and continue work on files from your Galaxy smartphone or tablet over Wi-Fi. Other companies have made moves in this direction (iMessage for Mac, anyone? ), but Samsung wants a more seamless connection between devices with features like drag-and-drop capability. Perhaps the most interesting bit of software that comes with the One 7 is BT Music Play 2.0. This lets you play music from your Galaxy devices through the PC's speakers over Bluetooth – better yet, it even works when the One 7 is in sleep mode. The demo showed to me displayed an instantaneous experience. Finally, the Galaxy – ahem – ATIV One 7 offers HDMI input, meaning it can act as a full HD monitor for various devices. (The Xbox One or PS4 immediately come to mind.) This way, not only could the all-in-one act as a PC, it could serve well in a console gamer's bedroom to save space, as one example that comes to mind. It's an interesting proposition, the new ATIV One 7, though one that only makes the most sense for Samsung fan boys and girls, so to speak. Of course, you can't really blame the company for that, but it warps the value proposition a bit. The ATIV One 7 is a gorgeous machine, rivaling today's most iconic all-in-one PC – there's no denying that. But this is a Samsung product for Samsung fans if there ever was, considering most people have already hopped onto the laptop as their computer of choice. Perhaps this is the way of the all-in-one now: to serve as a hub for all of your (brand loyal) devices rather than be your go-to device. Expect to see more all-in-one PCs adopt this model, namely HDMI input and software features that elevate the device to a new level for loyal fans. The ATIV One 7 has yet to be priced or set for launch, but we'll be sure to update when that happens.